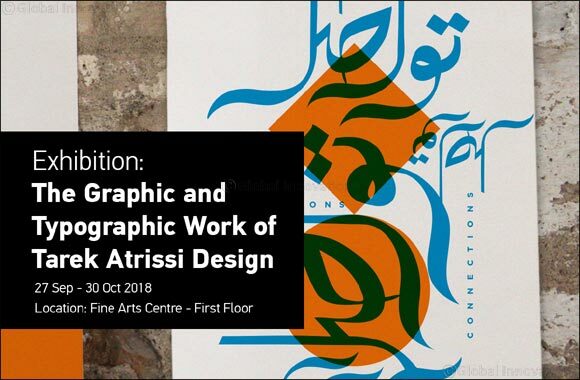 Kuwait City, Kuwait – September 23, 2018: The Fine Arts Centre at Sheikh Abdullah Al Salem Cultural Centre is hosting a four day event wherein the internationally acclaimed designer Tareq Atrissi will showcase his projects through a Bilingual Design & Typography workshop, followed by talks and an exhibition titled ‘The Graphic and Typographic work of Tareq Atrissi Design’. The event is also part of the Sheikh Abdullah Al-Salem Cultural Center Academy, which aims to facilitate public involvement in educational and development programs. The Fine Arts Centre at the Sheikh Abdullah Al-Salem Cultural Center is a platform for arts, culture and creativity. The programmes offered by the Fine Arts Center provide an opportunity for the public to meet and interact with artists. The event aims to celebrate Tarik Atissi’s studio’s 18 year of design practise in the field of branding, typeface design, poster design, and other experimental typographic and graphics work. The studio’s typographic and cross-cultural design approach produced projects that embed significant influence on the contemporary graphic design landscape in the Middle East. Tareq Atrissi will use the Fine arts Centre’s platform to offer a wide range of methods and inspire designers, artists, visual communicators, those pursuing cross-cultural graphics, branding, typography and Arabic visual culture. Mr. Atrissi is the Founder of Arabic Typography.com, an Arabic Type Foundry designing and developing of Arabic typefaces for branding needs. He is also an active member of the advisory committee of the ‘Creative Industries Fund NL’, the biggest cultural fund in the Netherlands supporting global design programmes. Mr. Atrissi is also the recipient of several awards including the ‘Type Directors Club’ New York, The ‘Adobe Design Achievement’ award, and the ‘Design for Asia’ award among many others. The workshop will share theories and case studies on bilingual typography practise with particular focus on branding concepts as well as practical application of bilingual monograms using a combination of Arabic and Latin. The workshop will be held on September 24, 25 and 26 between 5 pm – 8 pm while the Talk is scheduled for September 27 at 6 pm and exhibition at 7 pm. The exhibition will be on display until 31st of October,2018 at the project’s space wing of the Fine Arts Centre. The Sheikh Abdullah Al Salem Cultural Centre is part of the projects developed by the Office of His Highness the Amir of Kuwait with the vision of delivering world-class exhibitions and public educational programmes to the people of Kuwait. It is working on facilitating the exchange of knowledge and the development of critical, creative, and interpretive thinking skills.